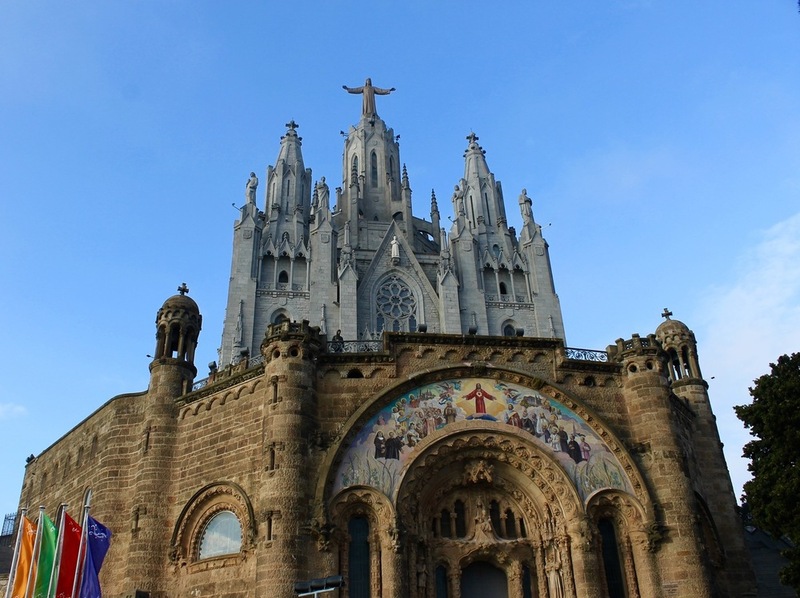 On the very edge of Barcelona, about 1700 feet high, lies Tibidabo mountain where the Sagrat Cor Church (Sacred Heart Church) and Tibidabo Amusement Park sit. This mountain peak can be spotted from most areas within Barcelona because of its height and the distinctive structures on its peak. These facts make it all the more exciting to visit. The trip can be planned as a whole day adventure, especially if you want to visit the amusement park, but it can also be squeezed in during an afternoon visit if you're short on time. Once at the mountain peak, unless you have kids dragging you to the rides, your first stop should be the Sacred Heart Church. This church is free to enter and absolutely stunning. From the outside you expect to enter into a majestic, high ceilinged structure. In fact, the bottom floor is a surprisingly small chapel covered floor to ceiling in tiny tiles that create beautiful, intricate images. After checking out downstairs, take the elevator (3€) or outside steps (free) up to the lookout area. From here you discover why the area downstairs is only a chapel. There's a whole other church upstairs! The church on the second floor is somewhat less impressive, but it's worth going inside (remember, it's free!). From the upper deck, snap some photos and enjoy the gorgeous Barcelona skyline view. Fun fact: the construction of this church started relatively recently for a European structure (1902) and actually came after the construction of the amusement park. For 3€ and a few more steps that elevator you saw at the base will take you most of the way up to see Jesus. Catch it from the bottom or middle level. Worth it. Alright, now on to the rides. 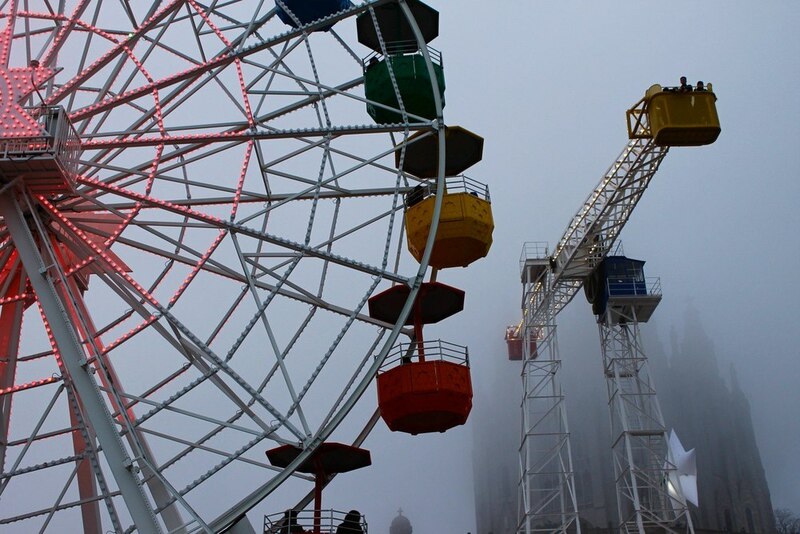 The Tibidabo Amusement park is one of the oldest, still operating amusement parks in the world. It opened in 1899 and a number of the original rides can still be ridden (I know, a little scary, but also super cool). The whole experience is not cheap (28.50€ for anyone over 4 feet tall), but it's a great one-time experience if you can swing it. The complete amusement park fills 6 different levels all built on the external edge of the mountain, which means there are great views at every turn. Individuals can also purchase access-only tickets to all 6 levels if they want to accompany their kids, but not go on any rides. There are large discounts for children under 4 feet tall as well as adults over 60 years old. Check the official site for details. The park is open noon to 6PM on Saturday, Sunday and holidays Oct.-Dec. It reopens March through June with a similar schedule, and extends to a summer schedule in late June which includes being open on many week days with opening times extending until 11PM in the evening. Check the official schedule before planning your visit. While you're on the mountain, you can also check out the traditional (free!) playground items scattered around the edge of the upper Skyline deck. Who said playgrounds aren't fun! Traditional Way: This will take you up the mountain partially on the Tramvia Blau (The Blue Tram) which is a traditional cable-car-like vehicle that is over 100 years old. Take the L7 (zone-1 metro ticket from within Barcelona) to Avenida Tibidabo (last stop). Board the Tramvia Blau at the JFK Plaza. Take the tram to its last station which is Plaza de Doctor Andreu. From here you will transfer to the Tibidabo Funicular which will take you directly to the top of the mountain. Here's the complete timetable for the tram. It typically comes every 15-30 minutes. The tram costs 5.5€ one-way and the funicular is 4.1€ if you also purchase a park entrance ticket (7.7€ if not). In my opinion this is similar to riding the San Francisco cable cars - it's a novelty that may be worth doing once, but definitely not the most price or time efficient. Bus (Summer only) Option: During the summer there is a bus that runs directly from Plaza Catalunya to the top of Tibidabo. It picks up here. It's called the T2A and departs every 20 or so minutes starting at 10:15AM. The cost is about 3€ each way. Considering from Plaza Catalunya you can also catch the S1 or S2 and follow the instructions outlined below, if you're willing to put in a tiny bit more effort, you can save 4€ to spend on rides. Public Transportation with a Funicular: This will cost you a single zone-1 metro ride (2.15€ if you're buying them one by one or 1€ if you have a 10-pass). Walk all of the way up the stairs to the Funicular. Board and take the Funicular to the top station (Vallvidrera Superior). Take the 111 bus (right outside the station) to the top of Tibidabo. You can transfer for free with your FGC ticket, so you do not need to pay twice. This bus comes about every 30 minutes. If you choose, you can also walk to the top, but I'd suggest only taking that option if you have any energy left when descending from the mountain peak :). Hope you enjoy the church, the rides, and the views! Need help budgeting for your travels? Download this step-by-step guide to learn how to choose a destination, set a budget, and save exactly what you need! Confirm your email via the note in your inbox and I'll get your Guide to Affording Travel over to you right away!